I discussed my opinion of this band's single "Sun" a little while back, and I'm happy to report back that their debut album "Down With the Sun" lives up to the high expectations I had for it. As bad as I hate when things don't live up to expectations, it's moments like this that I love. 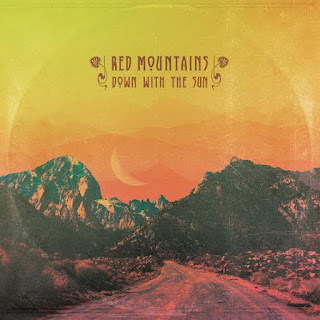 Red Mountains have come back with a chunk sublime stoner rock that will rival most anything you've heard this year. The opener "Six Hands" blew me away with their seamless melding of stoner rock with some grungy and even pop-ish sounding influences, giving it a dark tone, but still able to keep things catchy to a certain extent. One of those songs that seems a bit infectious the very first time you listen to it, then later on you find yourself still listening, as you've been hitting the back button every time it ends. It opens up with a bruising guitar riff before slowing down some shortly after, with a slow bass part taking up the spotlight. This is where the band's grunge and doom pedigree shows through just a bit, laying on the oppressively dark tone, and setting themselves apart from the majority of stoner rock bands in the process. Once you move into the second half of the track though, things change up a bit, beginning with a long guitar solo that's nearly perfect. It's a short lived reprieve though, settling back into the original bass riff, but with the guitar taking on a lighter role, giving the remainder song a completely different vibe from the start. There's one more little track before time runs out though, with another howling guitar solo taking over before the very end of the song. While not every song follows this same formula, because that would get kind of old, instead they change things up a bit here and there. I can confidently say that there isn't a bad song on the entire record though. The album was just released at the beginning of September, so you're not that late to the party, and there's still vinyl to be had from Nasoni Records, or check out the group's bandcamp for your digital fix.